Femada Shamam has been working in the field of care and support to the elderly for 16 years. In 1999, she joined the The Association for the Aged (TAFTA) team as a social worker. TAFTA is a Durban-based NPO that caters to the needs of older people. The organization provides services and support to approximately 7,500 people. Currently, Femada serves as Chief Operating Officer and is responsible for the planning and implementation of services to the elderly. Her role at the organization is also to provide representation at local and provincial forums with a view to lobbying and advocating for rights of the elderly. Her social work and bachelor of commerce training sets the foundation to create a balance between understanding the need and implementing sustainable models of care and support. 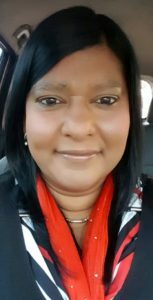 She has been involved in training and development of internal staff as well as other stakeholders in this field in the Durban area. She has also presented papers locally as well as at international conferences. Femada’s passion is exploring new models of care and support. On a personal level, Femada is a proud mum of a little girl who provides her with the balance between work and home. She is equally passionate about family and ensuring that the bonds remain strong; a trait which she inherited from her mother.